“Ralph Breaks the Internet” is less “Wreck-it Ralph,” and more “The Emoji Movie.” In other words, yikes. After Ralph’s (John C. Reilly) hijinks in the Sugar Rush arcade game cause the game’s steering wheel to be damage, he and Vanellope (Sarah Silverman) travel to the Internet in order to find a replacement steering wheel before the game is permanently unplugged. For a movie that literally has the whole world at its disposal, “Ralph Breaks the Internet” is creatively bankrupt and incredibly unimaginative. The characters are literally wandering around the Internet and one of the most frequented sites is an online “Grand Theft Auto”-esque game. It is too similar to the Sugar Rush racing game from the first film to be interesting, and it raises the question of why put these characters in the Internet if their biggest location is going to be another racing game. Why not just leave them in the arcade? The creativity that was lacking from the idea was certainly not used for the screenplay. “Ralph Breaks the Internet” has an incredibly weak script, chock-full of blatant writing, useless characters and plot conveniences. When it comes to the writing being blatant, Ralph’s character arc is that he has to get rid of a bunch of insecurities he has in regards to his friendship with Vanellope. In order to showcase these insecurities, Ralph is written so that he essentially complains all of the time when the two are separated or she has a different idea than he does. By the way, that is not hyperbole; a good chunk of the movie’s runtime is Ralph complaining. For useless characters, look no further than the Disney princesses, and returning characters Fix-It Felix (Jack McBrayer) and Sergeant Calhoun (Jane Lynch). The Disney princesses are given the integral role of motivating Vanellope’s character, yet they are used for a quick gag and then reappear briefly at the end to help the main characters. In regards to Felix and Calhoun, they have a B-plot lined up for them at the start of the movie, then they disappear until the last few scenes, and the arc their story would have had is completely figured out. Granted, these two have a minimal role in the film, but why give them a story line if it is not going to be shown? In terms of plot convenience, the majority of the story beats are created through sheer coincidence. For example, in the “Grand Theft Auto”-esque game, Ralph and Vanellope meet a street racer (Gal Gadot), who decides to help them get money to buy their steering wheel on eBay, right after they steal her car no less, by referring them to someone she knows who can conveniently help them with their goal. There are other examples of this and each one is as transparently lazy and groan-worthy. The character name of Wreck-it Ralph is quite fitting, assuming the ‘it’ is referring to “Ralph Breaks the Internet.” With a bad story to deal with, the experience is made worse by Ralph’s character, who is even more annoying than the earlier paragraph makes him sound. These annoying traits are fine for a character to have, but in the case of “Ralph Breaks the Internet,” they are a detriment. Personality traits like the ones described can be a part of a character, but should not be their entire identity. Ralph is nothing but an overly annoying and clingy person to the point where it is nearly impossible to like him. 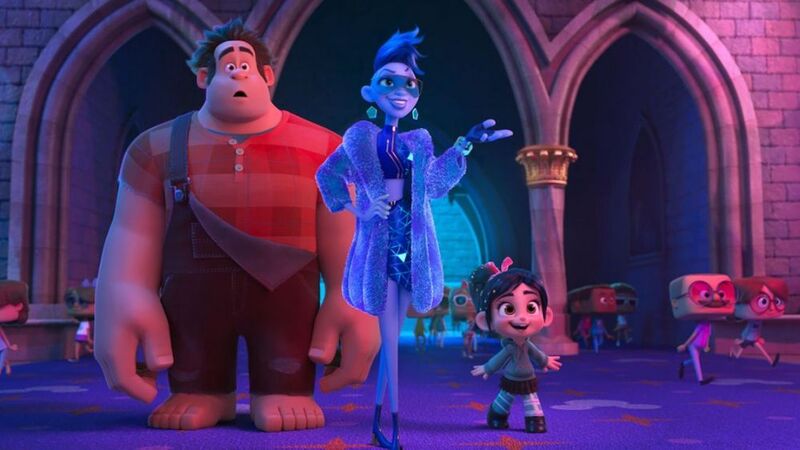 “Ralph Breaks the Internet” is weird when it comes to its Internet and pop cultural references. The movie is making jokes that its main demographic of younger children are probably not going to get, such as the references to viral videos or pop ups, and, not to beat a dead horse, but one of the main locations is a grizzled and violent “Grand Theft Auto”-esque game. There is even a part where Ralph goes to the dark web to buy a virus from a slug-like creature. All of these things and more make “Ralph Breaks the Internet” similar to “The Emoji Movie” of all things. Both are poorly thought out stories that are shameless in their practice, with neither one offering up much for enjoyment due to a lack of understanding about who its target audience is and because of how annoying it is.